It was from our own observation and from Graham’s research that we found out that the lions in the LLT area did not live in the traditional pride system within territories, but rather as individuals or in small bonded sisterhood groups in home ranges. Territories are defended, Home ranges are preferred hunting areas where other individuals are tolerated. This meant males also lived very differently, in that they had no pride to hunt for them, they never got a chance to get fat and lazy. This meant that without humans shortening their lives, they lived a longer life of fitness and had to hunt for themselves throughout their lives.I believe most people have the wrong idea about lions and lionesses and I have heard it bandied about that females are the ones that hunt and males only ever steal their food from the females kills. In my experience, this is only partly true in most places in Botswana, but at Leroo-La-Tau, completely untrue. Lets look at the normal pride structure in say Moremi, in Botswana. The females form the core of the group and these girls are incredible hunters able to orchestrate hunts by knowing what each other will do and when. They have this bond because they are nearly always related, sixtes, mothers, daughters, grandmothers. A pregnant female secludes herself when it is time to give birth and for a spall, and will raise the cubs alone. At a point she thinks it is safe she will introduce them to the pride, the girls first most of the time, then to dad. If he accepts them, they live, if not he may kill them. The males do this when they have taken over a pride, they sometimes kill any cubs still lactating and this is not mean or nasty although it seems this way to us but do so for reasons which will soon become clear. If dad accepts them, they become a part of the pride, the females for as long as they live provided the area can handle the pride size and if not they move off and form the core of another pride. Young males though never get to stay. At a certain age, dad kicks them out with a huge fight if necessary. They become wanderers. If they have brothers they go together, if not they go alone. Lets look at a male that goes off alone. He has to do everything himself, he defends himself, he hunts himself, he has to fend off Hyaena from his kills himself. He gets big and becomes an absolutely lethal machine. I have seen a single male soon after he brought down a full adult giraffe bull by himself and they often do this to buffalo. A female, even a group of females are no match for a male in peak performance. He is a beast and worthy of the utmost respect. When he comes of age to take over a pride, he alone may oust the males of a pride that has more than one male. If he is successful, the the pride females may decide to keep him on. His survival on his own has made him the kind of protection they need and his reward for being their protector is the right to be fed, whether they want to give him their food or not. Now when he finds cubs in the pride that are not his he may kill them and the reason for this is that in 2 to 3 years another lion may oust him and time is short. By killing the young he brings the females back into cycle and so he can get his own genetics into the system as soon as possible, and have time to raise them. More often than not he is ousted before he has a chance to breed with his own offspring. By the time a male is 8 years old, he is on his way out of the system. Now at Leroo-La-Tau, there were no pride structures, males roamed free in home ranges and hunted without females all through their lives and so may only live to 9 or 10 but remain strong and fit and capable throughout. This was not the case with Salé. Salé is the Setswana word for a saddle, like the saddle of a horse, and this lion got his name from a black patch of thick mane that had grown down his back. He was a monster and everything he did was fast. He looked as long as a train and he seemed as tall as a zebra. He was wonderful to see. When he roared, you know, lions have that grunting they do several times after a roar, Salé used to do this at double speed, so we could always identify his call. We also followed him up the river one day and where other lions strolled, Salé’s pace was almost like a run. We couldn’t believe the distance he covered at speed. He was by far one of the most impressive animals I have ever seen, a true Kalahari Black Maned Lion. One day we were out driving at the far end of the small concession we used, and there was a pool below the highest cliffs we had in our part of the river. We noticed lion track and a drag mark and excitedly figured we would see a lion on a kill. We were to be very disappointed. What we found was a wounded Salé. As we got close to him, he charged the vehicle, which was impressive as only his front legs were working. We figured he had been bitten by a snake and so got hold of the Botswana Defence Force, we knew they had a lion programme and we figured they could fix him up, rehabilitate him and return him to us. They sent a BDF vet from Gabs to Maun and then choppered him in to LLT. They darted Salé and investigated his wound. There was nothing they could do. Someone had tried to poach this beautiful beast and had shot him with a shotgun, one of the pellets cutting through his spinal column. It was very sad and they had to put him down. Salé became a driving force in our efforts to separate the cattle and the wildlife with a fence line to save the wildlife and reduce the conflict with cattle owners. In one year we lost 8 lion to cattle owners, one particular man was driving on the new tar road from Khumaga to Motopi and saw some lion. He simply pulled over and shot 3 of them, a mother and 2 small cubs. 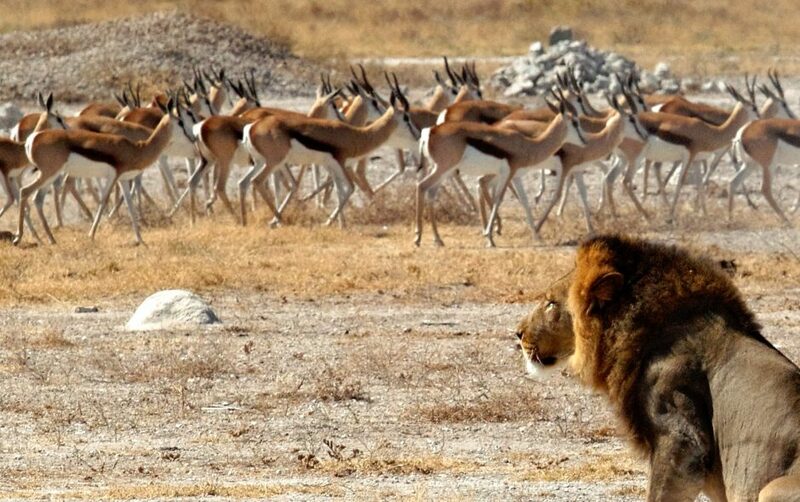 It made us so upset and we knew that no lion population could absorb this kind of attention. The cliffs under which we found Salé that day, we named Lions Cliffs in his memory.